Serial buses have become ubiquitous for data communications on aircraft and spacecraft. While many of the standards have been around for decades, they still present challenges and have to be tested to ensure reliability under all conditions. Physical layer problems can cause incorrect messages to be read at the receiver, or an incorrect sequence of events can confuse the receiver. Reliability is especially important, particularly in avionics. To ensure the reliability of control and communications buses, each design and subsystem has to meet certain criteria that are typically defined in a standard such as MIL-STD-1553. In addition to testing whether electrical parameters comply with the standard, the communications performance of the entire bus system has to be verified. Therefore, reliability tests are essential during development and later on during installation and maintenance of bus systems. Having a tool that allows you to time-correlate the physical layer to the actual decoded messages going across the link can give you more confidence in your design. All without the tedious task of manually decoding the bus. 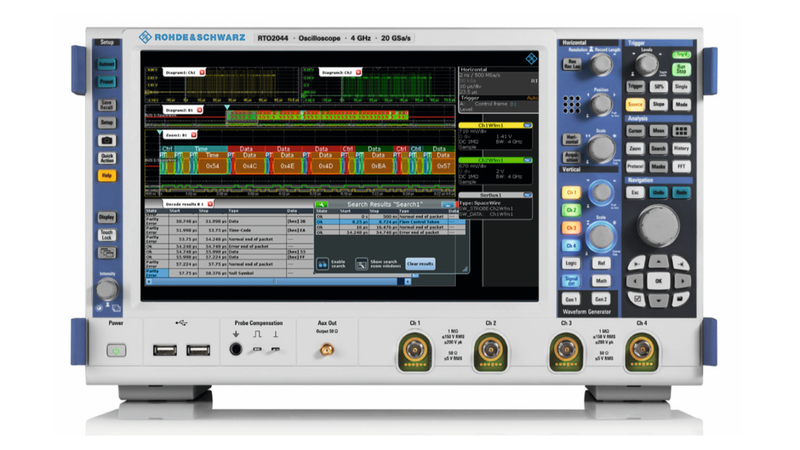 The R&S®RTE and R&S®RTO oscilloscopes provide a powerful tool for debugging low speed serial buses by turning the scope into a protocol analyzer with the ability to see the time-correlated analog waveforms at the same time. 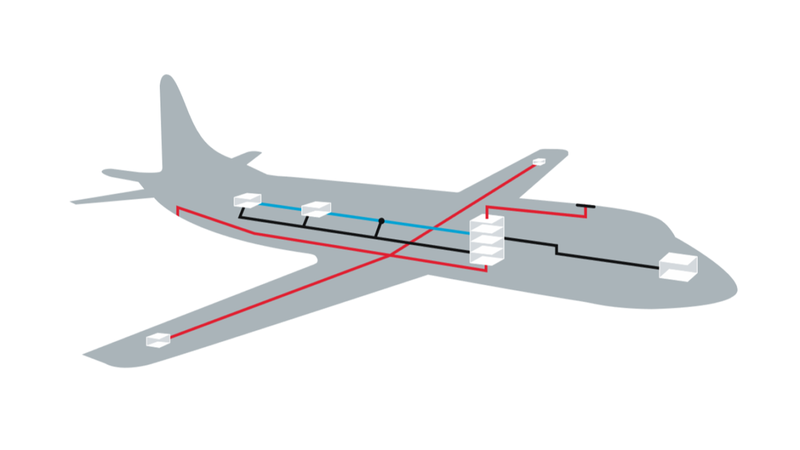 The complexity and requirements of aircraft data networks (ADN) have greatly increased over the years. Starting with analog, point-to-point connected systems, there are now a number of standard buses for the avionics and aerospace industries. Some, such as ARINC 429 and MIL-STD-1553, have been around for decades. Others, such as SpaceWire, are relatively new, and still others are proprietary. The R&S®RTE and R&S®RTO oscilloscopes support all of these buses. Both standards were drafted in the 1970s and are still widely used in the civil (CAS) and military (MAS) aerospace sectors. While ARINC 429 is defined for data rates up to 100 kbits/s, MIL-STD-1553 supports higher data rates up to 1 Mbit/s. Besides other parameters, the MIL-STD-1553 differs in that it has a dual-redundant and bidirectional communications structure. 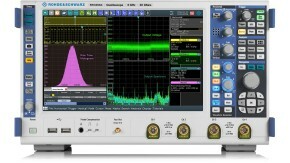 The R&S®RTO oscilloscope triggers and decodes continuous SpaceWire data streams. SpaceWire (SpW) is a more recent technical standard used on spacecraft. It provides high-speed links and networks with data rates up to 200 Mbit/sec and more. The standard is based on the IEEE 1355-1995 standard and has been adapted to requirements in space with respect to robustness, power consumption and EMC. The challenge of decoding a SpW data stream is the missing package identifier that is typically used as trigger. SpW also has a handshake, but if no errors occur, data transmission can be a gapless and patternless series of bits. 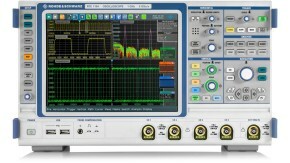 Rohde & Schwarz has developed a new synchronization algorithm that enables triggering on a continuous SpW data stream. The trigger conditions include control frames, data patterns, NULL frames, time codes and error conditions. The R&S®RTE and R&S®RTO oscilloscopes are the first to support triggering and decoding of a continuous SpaceWire data stream. The powerful, easy-to-use R&S®RTE and R&S®RTO digital oscilloscopes are ideal for verifying the electrical parameters of standard and proprietary serial buses and for monitoring and debugging entire bus systems. Their ability to trigger and decode continuous SpaceWire data streams makes them particularly suited for the aerospace and avionics industry. 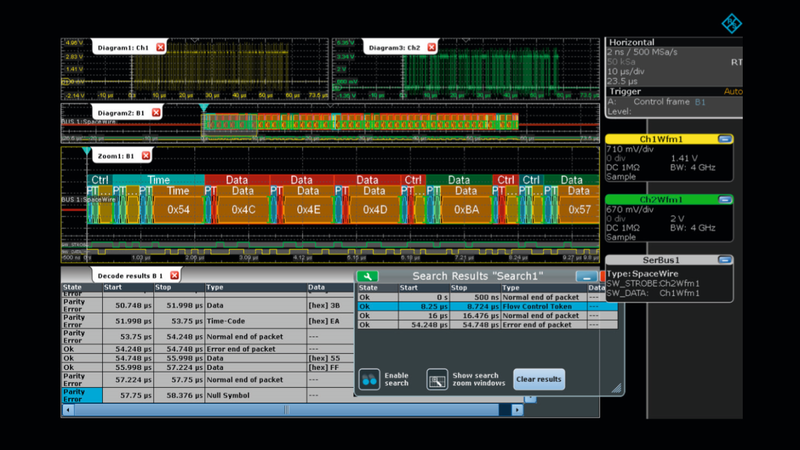 SpaceWire decode on the R&S®RTO oscilloscope showing data and control characters, control codes and error messages of a continuous data stream.